What are the benefits of our training and consultancy for Laboratory Safety Awareness? Implementation of proper Laboratory Management System as per requirement improves quality observed in daily laboratory practices. With the technical requirement of laboratories, it is essential to get updated and include formal personnel training on safety plans and awareness. We are offering to laboratories a comprehensive model for Laboratory Safety Management System aimed at improving their ability to consistently reduce risk and increase safety awareness. We have conducted many Lab safety training programs so far in more than 50 testing and calibration laboratories worldwide and trained their employees about lab safety requirements. During laboratory safety consultancy, our technical consultants will guide your employees to implement safety system for risk-free environment in your laboratory. This laboratory safety awareness training presentation kit is very useful while conducting corporate training on laboratory management system in both calibration as well as testing laboratories or any work area. It can be an effective tool while training your employees about safety requirements in laboratory. The training material in ppt format is pleasingly designed and presented to clearly communicate the message and establish a much better understanding of safety in laboratory. It helps to those professionals who want to establish a good safety system in the laboratory with the goal of zero accident level and no major, minor or nearly missed accidents. Exercises on computer and desk stretches. This part covers write-up in .doc format for ready-reference and participants’ understanding and reading. This part includes a trainer's guide and handouts to understand subject well. The handouts are given in editable MS Word format. Also included are Workshops and case- studies to evaluate effectiveness of training on laboratory safety. 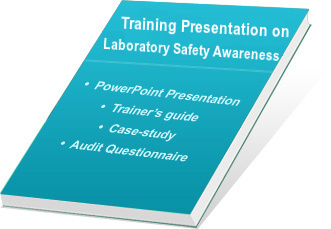 Why to Purchase Our Lab Safety Awareness Training Presentation Kit? The entire presentation material and handouts are written in plain English. Handouts are in MS Word 2007 and presentation is made in Power point. Training presentation slides are designed under the guidance of experts and globally proven consultants having experience of more than 25 years in Laboratory setup and accreditation. User-friendly and easy-to-learn; one can add company logo as well as voiceover to the presentation. Completely editable presentation, hence, saves time and cost. View free Demo of Training Presentation Kit and purchase it with secure online transaction.